Houssam Abbas received the Ph.D. in electrical engineering from Arizona State University. From 2006 to 2014, he worked as a CAD engineer in the SoC Verification Group in Intel. In that role, he developed software tools and methods for SoC verification and testing, including formal verification and coverage-based testing, and for the verification of low-power digital designs. In 2015 he joined the ESE department at the University of Pennsylvania as a research postdoc. While at Penn, he co-lead the F1/10 autonomous racing effort which has grown into an international competition. He also developed a semester-long hands-on class to build, program, and race self-driving cars, with all material at f1tenth.org. In January 2019, Houssam will join the School of Electrical Engineering and Computer Science at Oregon State University as an assistant professor. 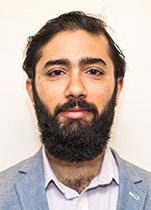 Abbas' research interests span the design, control and verification of cyber-physical systems, with particular emphasis on autonomous systems, like self-driving cars and drones, and medical devices. In particular, he is interested in the development of light-weight verification techniques that can run on-board autonomous systems and their dual use for control. He is also investigating distributed control algorithms for complex aerial missions. On the medical side, he is currently investigating programming languages suited for programming resource-constrained medical devices, and developing theoretical guarantees on their energy use.